This was a bookgroup selection, which I would never have chosen for myself. Comedians’ autobiographies are not a must-read for me: I’ve read Judith Lucy and um…… surely Clive James is more than a comedian? So let’s just say that I’m drawing from a very small puddle of familiarity with the genre. Ahn Do is a young Australian comedian of Vietnamese heritage. I must confess that while I know who he is, I can’t remember actually seeing him perform, as he tends to work on commercial channels and aimed at a younger demographic than I. The book reads like a series of stand-up routines, with very few of them extending beyond two pages (and sometimes much shorter) often with a rather inflated hook sentence to draw you in, and a soft punchline at the end. I must say that it’s not a structure that particularly satisfied me because it left you skating across the topic without tunnelling very deep. 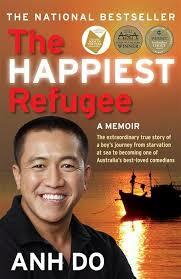 The book was organized chronologically as Ahn Do told his story of travelling to Australia from Vietnam as a ‘boat-person’, his family’s striving for financial security, the break-up of his parents’ marriage, the progress of his own career and marriage, and his reconciliation with his estranged father. The story was far better than the telling of it. At a time when our government has twisted the language to conflate ‘asylum’ and ‘illegal’, it was instructive to read of the fear and precariousness of their trip by sea to Australia, and their deep gratitude to the then-government for offering a new life to the family. In many ways the family acted in the ways that most evoke fear and disdain for the Australian population- the extended family living in crowded conditions in a factory, the domestic sweating of female family members, the buying up of property- but all these activities made complete sense within the cultural world-view and history of this Vietnamese family. What shines through is Ahn Do’s love for his family, and his gratitude for his mother in particular who worked so hard when the family broke up. There’s so much we don’t know when we sit in the back seat of a taxi, wary perhaps of the driver; when we scowl at large family groups at auctions ‘taking over’ the suburb; or when we see veiled mothers and children at shopping centres. I, at least, feel shy about asking and yet there is probably so much that I could learn, and this book is such an experience. That said though, Ahn Do should probably stick to stand-up comedy. This one was turned into a picture book for children, which was quite good, and more than that, useful for (hopefully) shifting attitudes towards refugees. I found it very sad at my school that because of the toxic discourse about refugees in the media, children of refugees would only talk about it very rarely and only in a safe place like my library where they knew I would not tolerate any racism. Yes I’ve read the picture book version too, and liked it. But I have a yearning to read comedian memoirs- I’ve wanted to read this one since it came out, I’m currently listening to Judith Lucy’s Lucy Family Alphabet in the car- and loving it, and always seem to want to read the next new one. Magda Szubanski anyone? Again I’m keen. I’m sorry you didn’t enjoy it more Janine, I’d only heard good things til now. I do think it’s important to have our refugee stories out there though of course. I felt let down when I learned that Anh Do had hired a ghost writer for this.